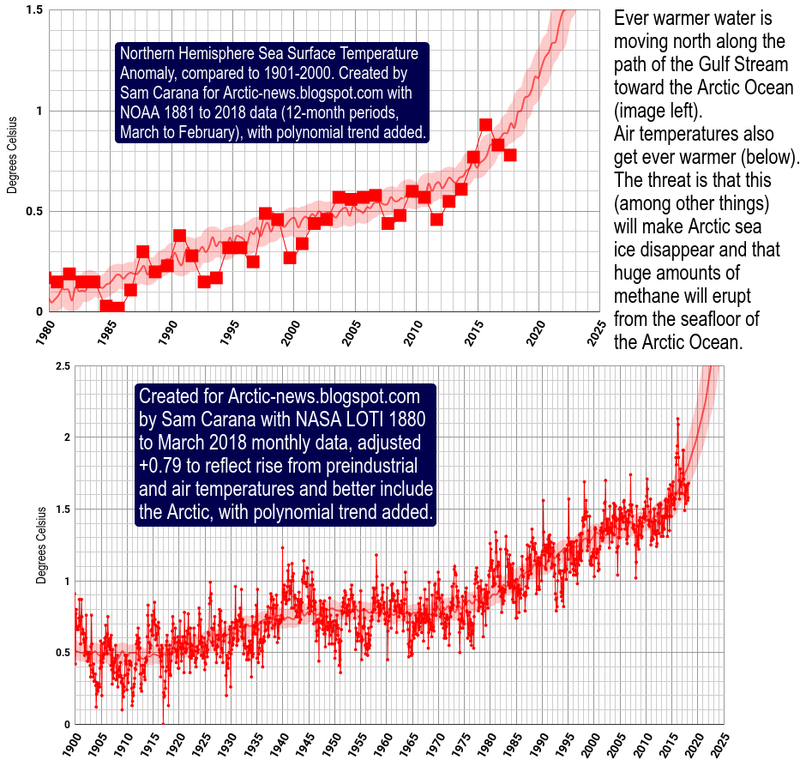 Earth is losing her sea ice. 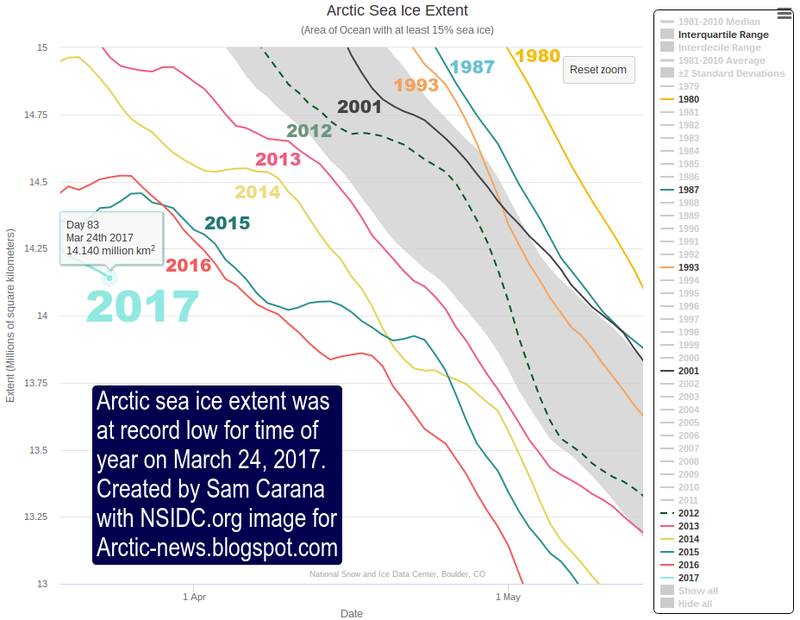 Arctic sea ice was at record low extent for the time of the year on March 24, 2017, as illustrated by the image below. 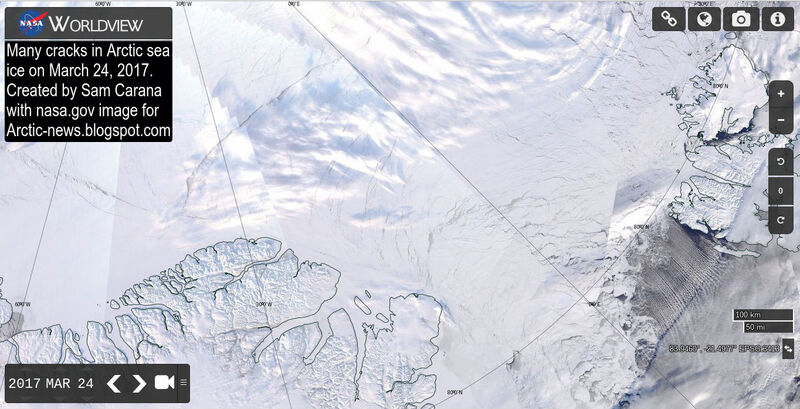 As the image below shows, on March 24, 2017, Arctic sea ice featured many cracks (top of Greenland is bottom left and Svalbard is on the right). The poor state of Arctic sea ice is also reflected by the sea ice volume, as depicted by the image below, by Wipneus, showing PIOMAS anomalies up to March 2017. 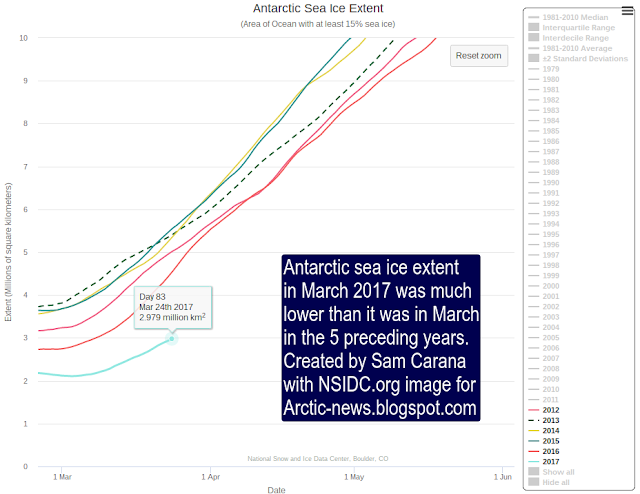 On March 24, 2017, Antarctic sea ice extent was also much lower than it used to be at this time of year, as illustrated by the image below. 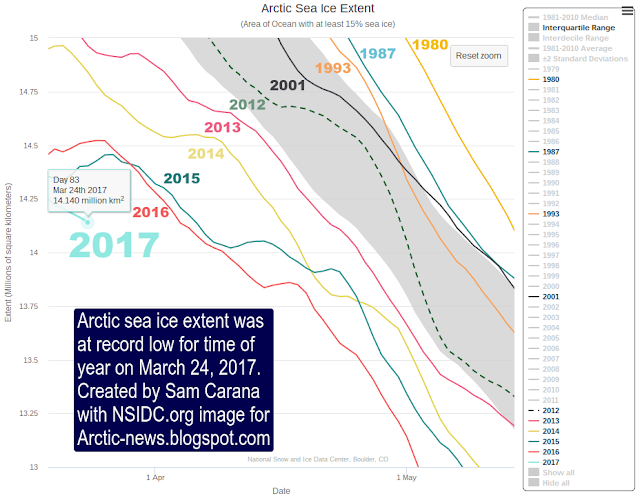 Altogether, global sea ice extent has now been at a record low for many months, as illustrated by the graph by Wipneus below. This means that a huge amount of additional sunlight has been absorbed over these months, instead of getting reflected back into space as before. 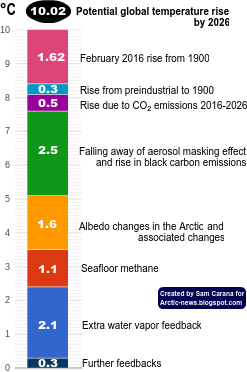 As Earth loses her sea ice, tipping point look set to be crossed that could result in rapid acceleration of Earth's temperature, as discussed at the extinction page, which warns that surface temperatures of the atmosphere could rise by some 10°C or 18°F within a decade, i.e. by 2026. The world shadow-gov is constricting voices of science and little guys in a vain attempt to profit take while hysteresis remains till heat and heat of entropy rise goes Full Tort w Greenhouse Hell bound for leather against Habitable Zone in perfect-storm of Extinction unless Act of God; snaps Real at luck and a half probability that ingenuity of youth sings. Not about that we can change the world though. We are what we are(idiots). But the world will change anyway and by the looks of it, wont be pretty for the idiots. Thanks for your work. I've been concerned with the levels lately. 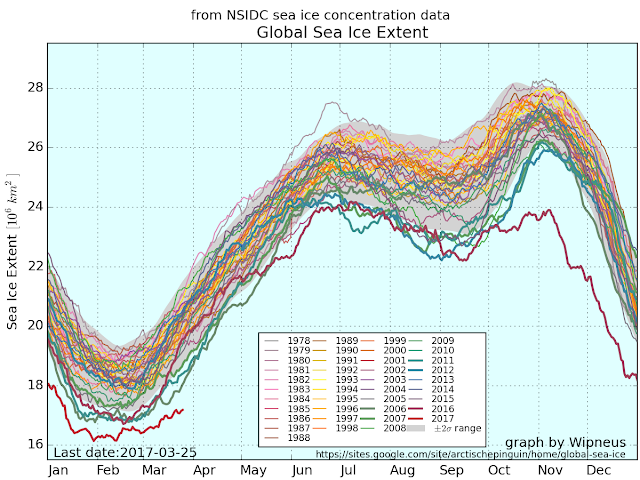 All it takes is another melting period like we had 5 years ago. That's it, man. We're toast. Plus, with all this tom foolery at the White House, everything seems to be set straight for a course with a disaster of cataclysmic proportions. Doesn't that ice help keep the tectonic plates from shifting more often? Serious ramifications in all of this to come. Massive weight redistribution with land ice from greenland going next in line. 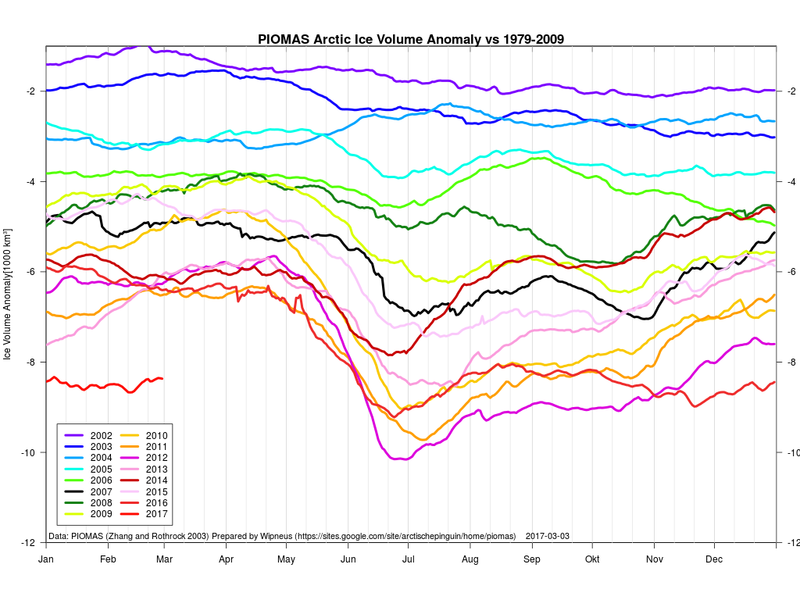 How much weight shifting in a year's time could drastically alter the axis and wobble? Wish I knew the answers and I had a crystal ball. My parents worried about retirement when they were my age (42 -3/29/75). I'm worried about surviving. That's a bit of contrast there. Hope. I'm clinging to it. Trump will have to pry it out of my cold dead hands if he wants me to let it go.